Pulmonary oedema - either haemodynamic (fluid overload, cardiac failure) or permeability induced (acute lung injury / ARDS). Clinical examination and supine CXR have very poor sensitivity for detecting interstitial oedema. Sensitivity and specificity of US approaches 100% when compared to CT. They are long long, vertical hyperechoic lines which continue to the depths of the image. They look like comet tails (an old name for them). Occasional B-lines can be seen in normal lungs (especially at the bases). Up to 2 between 2 adjacent ribs can be considered normal. 3 or more are pathological. They can be localised, disseminated, homogenous or non-homogenous depending on the pathology. They are present in any disease affecting the interstitium. The commonest cause by far is pulmonary oedema. They are usually separated by about 7mm. The presence of these artefacts implies high acoustic impedance to US (air and water) and this element must be small as it is not directly visible with the resolution of US (< 1mm). The only anatomical explanation for these facts is thickened interlobular septa surrounded by alveolar air. These septa are in contact with the visceral pleura and are about 7mm apart. In pulmonary oedema the juxtaposition of air in the alveoli and water in the interlobular septa causes the sound to reverberate to and fro between the septa creating a line for each reverberation which combine to form B-lines. In pulmonary oedema they are the equivalent of Kerley B lines. When oedema becomes more severe (ground glass appearance on CT), the mixing of fluid and water causes more B-lines to be generated and they become closer together. Very severe oedema can cause the B-lines to fuse with a hyperechoic confluent pattern that fills the space between 2 ribs. The physical and anatomical mechanism of B-line generation is debated but Lichtenstein's explanation above seems convincing. Severe alveolar oedema does not cause a fully consolidated US appearance - there may be small areas of consolidation but the lung will not appear hepatisised. B-lines in a transverse image. They are best appreciated in a moving image. Pneumonia and pneumonitis (in pneumonia the B lines will be peri-lesional to consolidations and there will be comets deep to the far margins). B lines are lateral in the early stages (before symptoms appear) and then progress anteriorly with increasing severity. These lateral B lines are commonly seen in haemodialysis patients prior to a dialysis session. In symptomatic oedema, B-lines will be anterior, widespread and bilateral (upper and lower BLUE and phrenic points). B-lines quickly disappear after treatment of pulmonary oedema. There can be severe respiratory distress with relatively few B lines (whereas in fibrosis there can be little respiratory distress with lots of B lines. Fluid descends to dependent areas. The B-lines are therefore posterior, less widespread and more likely to be asymmetrical. Lung sliding may be reduced or absent (as it is an inflammatory process the pleura can get stuck together). Anterior subpleural consolidations may be present. Spared areas of normal parenchyma may be present. Pleural line abnormalities (irregular thickened fragmented pleural line) may be present. Multiple B-lines present in a diffuse and non-homogeneous distribution. The distribution of B-lines correlates with computed tomography (CT) signs of fibrosis. Pleural line abnormalities (irregular, fragmented pleural line). Subpleural abnormalities (small echo-poor areas). There can be minimal respiratory distress with lots of B lines. B-lines are only present in 8% vs 100% in those with haemodynamic oedema. B-lines are not present as asthma affects the bronchi with no signs extending to the pleura. B-lines cannot be present with pneumothorax so even 1 completely rules it out. This is particularly useful when lung sliding is absent with ARDS but B-lines are visible. As 90% of consolidations reach the posterior pleura, posterior B-lines rule out consolidation 90% of the time. The absence of B-lines can reassure that fluid will not be detrimental to gas exchange. Their presence should, in most circumstances, dissuade you from giving further fluid. B-lines appear with interstitial oedema (prior to alveolar oedema). It has been proposed that the appearance of B-lines be the stopping point when giving a fluid challenge with B-lines corresponding to the top flat portion of the starling curve. The absence of bilateral anterior B-lines has a positive predictive value of 97% for a PAOP <18mmHg (negative predictive value of 25% - ie you can have non-cardiogenic pulmonary oedema with a PAOP <18). The PPV is 91% for a PAOP <13. B-lines suggest weaning will be more difficult. B-lines are defined as discrete laser-like vertical hyperechoic reverberation artefacts that arise from the pleural line (previously described as ‘‘comet tails’’), extend to the bottom of the screen without fading, and move synchronously with lung sliding. The term ‘sliding’ (rather than ‘gliding’) should be used in the description of pleural movement. 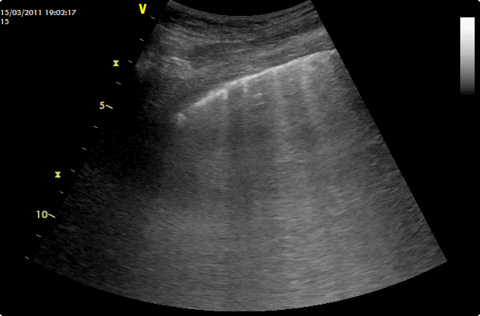 In the evaluation of interstitial syndrome, the sonographic technique ideally consists of scanning eight regions, but two other methods have been described: – A more rapid anterior two-region scan may be sufficient in some cases. – The evaluation of 28 rib interspaces is an alternative. – Two or more positive regions (see B-D2-S2) bilaterally. – The 28 rib space technique may semi-quantify the interstitial syndrome: in each rib space, count the number of B-lines from zero to ten, or if confluent, assess the percentage of the rib space occupied by B-lines and divide it by ten. The term ‘‘B-pattern’’ should be used (rather than ‘‘lung rockets’’ or ‘‘B-PLUS’’) in the description of multiple B-lines in patients with interstitial syndrome. The primary sonographic sign to be identified is the presence of multiple B-lines in a diffuse and non-homogeneous distribution. RL-D3-S2 (strong: level B) In patients with diffuse parenchymal lung disease (pulmonary fibrosis), the distribution of B-lines correlates with computed tomography (CT) signs of fibrosis. B-D2-S5 (strong: level B) Lung ultrasound is superior to conventional chest radiography for ruling in significant interstitial syndrome. B-D2-S6 (strong: level B) In patients with suspected interstitial syndrome, a negative lung ultrasound examination is superior to conventional chest radiography in ruling out significant interstitial syndrome. In patients with cardiogenic pulmonary edema, semi- quantification of disease severity may be obtained by evaluating the number of B-lines as this is directly proportional to the severity of congestion. In patients with increased extravascular lung water, assessment of lung re-aeration can be assessed by demonstrating a change (decrease) in the number of B-lines. In the majority of cases of acute lung injury or ARDS, ultrasound quantification of lung re-aeration may be assessed by tracking changes in sonographic findings.